Every month we choose an installation that we take great pride in or one that has a different background. 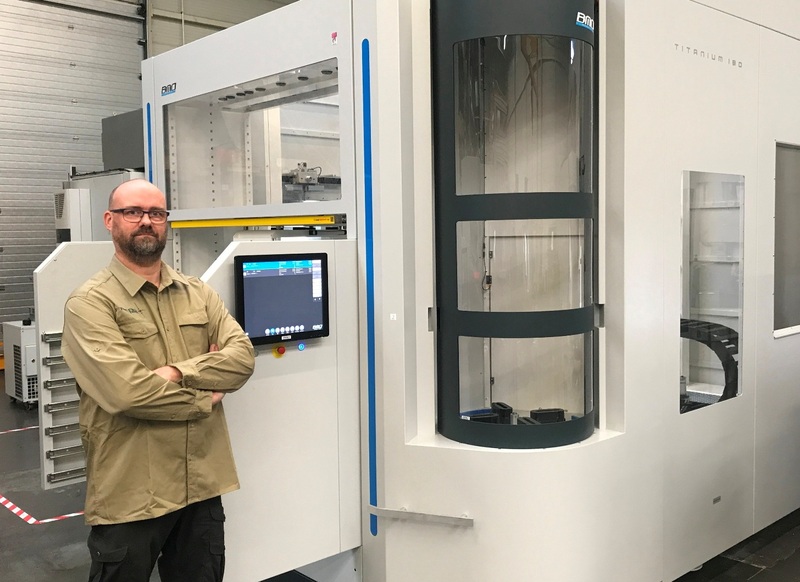 From all the ones we implemented this past month, we chose the installation at Frerotech, where we coupled a BMO Titanium to two Hermle milling machines, a 5-axis Hermle C-800 and a 5-axis Hermle C 40-U for bigger workpieces. There is great innovation in the BMO Ti180 robotcell, as it is delivered with a linear carriage, increasing the robot’s range substantially. This allowed for the creation of a considerable workspace (1200mm) between robotcell and machine. On a Friday afternoon, we arranged a meeting with Freek Sensen, the proud owner of a unique BMO Titanium 180. Unique in the sense that BMO Automation delivered this unit in the colour scheme chosen by the customer himself. Freek showed his pride as owner of the new equipment by climbing onto his Hermle milling machine to take a beautiful top-view photograph of the new combination. One of Frerotech’s requirements was that both CNC machines, prototypes and single pieces, had to be hand-operated and thereby accessible. For this reason is the robotcell 1200mm removed from the machine. To ensure that the robotcell can be loaded, it is placed on a linear carriage, enhancing the range of the robot arm. The desired gap is not shielded by doors, but is guarded by a laser scanner. BMO’s innovative solution allows the operator to perform manual labour on the machine. “The robotcell is user-friendly and foolproof; it looks striking in our own colours” Freek says with a wink. Frerotech maintains 24/7 production with the Titanium 180, at which various types of products will be manufactured. The multi-functional servogripper as well as the possibility of positioning several types of pallets in the Hermle machine, allows loading a mix of products. 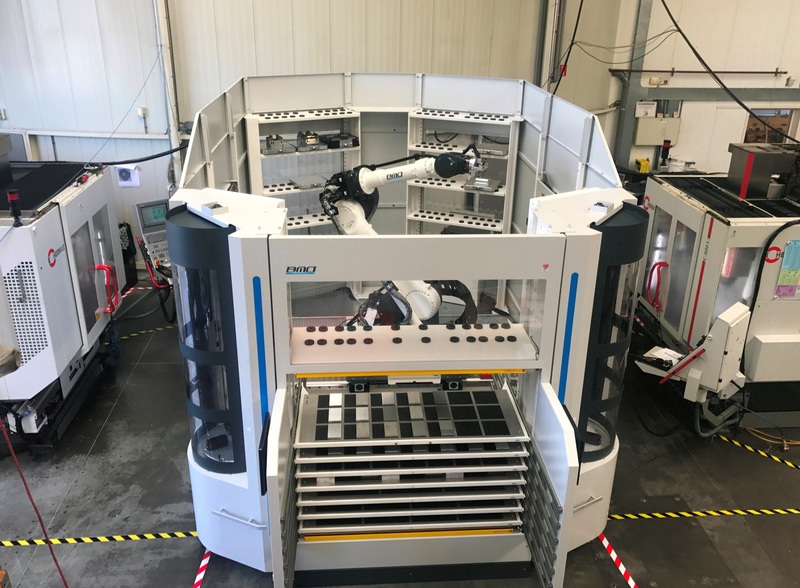 “The purchase of this robot has improved our capacity and flexibility and we hope that, as a result, we can improve our competitiveness” remarked the proud owner of a unique robotcell. We at BMO Automation look back at this installation with pride and the knowledge that we could fulfill all the requirements of Frerotech. We wish Frerotech all the best in automatic production with their new purchase. 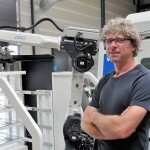 Frerotech is situated in Stein (Limburg) and was established in 2001 by Roel Baars and Freek Sensen. Both are experienced toolmakers with ample technical and CNC experience. Over the course of years, Frerotech has developed into a mature company that has divided its core business into several organizations, consisting of six CNC Hermle processing centres. Frerotech specializes in the manufacturing of complex mechanical components from single pieces to serial parts. Frerotech has particular expertise in the design and build of thermo form moulds. The Frerotech built mould and die equipment (mouldsand Trimtools) are used and valkued worldwide.